"People's charter" opposes nuclear plant for Mithi Virdi in Gujarat, says India is on "suicidal path"
A people's charter on nuclear energy was adopted at a convention of prominent intellectuals and activists in Ahmedabad which voiced concern of the people of Mithi Virdi (Gujarat), along with other places where nuclear power plants are being put up -- such as Koodankulam (Tamil Nadu), Jaitapur (Maharashtra), Kovvada (Andhra Pradesh), Gorakhpur (Haryana), Chutka (Madhya Pradesh) and Haripur (West Bengal). It supported what it called "relentless struggles against these anti-people and unsafe nuclear power projects being promoted by the Nuclear Power Corporation of India Ltd (NPCIL)". Among the participants were Gandhian Chunibhai Vaidya, well-known social scientists Ganshyam Shah, Praful Bidwai, Surendra Gadekar, Vaishali Patil, Achyut Yagnik, Neeraj Jain and Sudarshan Aiyangar, vice-chancellor, Gujarat Vidyapith. The charter, which claims to have shared experiences, struggles and visions for a future free of nuclear energy developed by grassroots movements, says, "The Fukushima nuclear accident in Japan has led to global rethinking and a recognition that nuclear power is anachronistic (and) catastrophic". Adopted at Gujarat Vidyapeeth, the charter says, "India is pursuing a suicidal expansion of nuclear power. The claim that nuclear energy is indispensable for the country’s energy security is deeply flawed. The main motive in going in for a large-scale nuclear programme is to deliver on the promise of paybacks made to the US for the Indo-US nuclear deal and to other countries for their support in getting an endorsement for that agreement from the International Atomic Energy Agency and the Nuclear Suppliers’ Group for India." It adds, "Such expansion will strengthen the domestic and foreign industrial lobbies that see great opportunities to make money through equipment supply and other contracts. It will greatly reinforce the power and privilege of India’s highly secretive Department of Atomic Energy and further promote the highly centralised and energy-intensive path of development that is part of the neoliberal globalisation project adopted by the Indian elite and the government." Saying that communities near the existing nuclear facilities in Tarapur, Rawatbhata, Kalpakkam, Kaiga, Kakrapar and Hyderabad have also been raising voices against radiation leaks and their harmful effects, which are often hushed up by the authorities, the charter underlines, "Workers in the nuclear industry have come out against NPCIL.We call upon the people of India to join up in stopping this nuclear insanity and to foster and campaign for an alternative future based on renewable, sustainable and equitable forms of energy generation." * A moratorium should be imposed with immediate effect on all proposed nuclear reactor projects. An open and democratic national debate on nuclear energy and its alternatives be organised in the country. * A transparent safety review of the entire nuclear sector be carried out by independent experts. Land acquisition for nuclear projects should immediately be put on hold till the new Land Acquisition and Rehabilitation Act comes into effect. * Periodic safety reviews of existing nuclear reactors must be carried out by independent experts. The authorities should facilitate long-term and medium-term health studies by independent health experts near the reactors; their findings must be publicised by the government. * Prior to undertaking any activity, including the preparation of a detailed project report, the government must set up a body of independent experts to carry out baseline health and environmental surveys in all areas where it is proposed to set up reactors, to start mining and otherwise establish activities and structures connected to the whole nuclear fuel cycle. The survey results must be transparently shared with the local public, which must assured full and unimpeded access to their health data. * A citizens-based network for radiation monitoring near nuclear facilities should be created and financed out of a public fund expressly created for that purpose. * Independent health inspection of nuclear workers should be carried out periodically. * The government must immediately and unconditionally withdraw all charges of sedition and other false allegations against people protesting against nuclear projects. By not doing so the government is violating the recent Supreme Court judgement with respect to Koodankulam. * The government must acknowledge the inherent hazards of nuclear power and institute a high-level citizens’ commission to examine the appropriateness, desirability, safety, environmental soundness, costs and long-term problems posed by nuclear power generation. The commission must include independent experts, social scientists and civil society representatives. The charter asks the Government of India not to "violate or bypass the Nuclear (Civil Liability) Act 2010 by formulating Rules that violate the Polluter Pays principle and the Act’s spirit and purpose". It must assign "the full liability for accidents and other harm to the operators and suppliers of nuclear installations proportionate to the damage likely to be caused. It is bad enough that the present Act is not based on the moral and legal principle of absolute liability in case of accidents. It must not be further compromised by Rules calculated to artificially limit the suppliers’ liability." 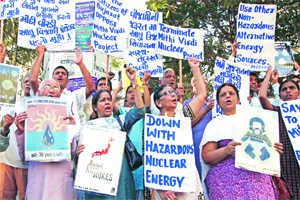 In an apparent reference to the nuclear plant proposed in Gujarat, where the environmental impact assessment was done by an agency which did not have accreditation, the charter says, "The existing process of Environmental Impact Assessment for nuclear projects does not even consider or mention their specific nuclear hazards, including radiation leaks, waste storage, transportation risks, accidents, etc. This must be radically reformed." The charter adds, "The granting of environmental clearance to all nuclear projects must be tightened with mandatory public hearings based on full disclosure of all pertinent facts, including those related to the generic problems of nuclear electricity generation, including radiation, effluents and emissions, requirements and availability of resources such as freshwater, impact on forests, fauna and flora and local eco-systems, potential for accidents and mishaps, waste separation, storage and disposal, hazards from transportation of nuclear materials, and risks to public and planned measures to mitigate these".